Simple and Modern:The wireless and portable design allows you to install the doorbell in any section of your retail store, business, home and classroom. Also can used as a simple alert device and a paging system. Long Operating Distance :The doorbell supports 1000ft/300m working range (depending on the operating environment). Rest assured that you¡¯ll never miss any important guests or urgent deliveries again with the help of this doorbell. Durable ,Waterproof and Dust proof Transmitter: IP55 dust proof and waterproof rating,working temperature ranging from -22 degree F to 158 degree F, built-in 12V/23A battery,the transmitter can work in even the harshest weather conditions. Make Your Night More Beautiful:Built-in human body induction night light will auto turn on and off with 45s delay when people walk closely it within 1-7m. > >Scroll Up & Click Add To Cart-Get 1 Set for Yourself & Give the Gift to your family & friends. 55 CHIMES WITH 5-LEVEL ADJUSTABLE VOLUME: The no battery receiver provides 55 different ring tones with adjustable volume from 0-110dB. Perfect as urgent pager for the older, or pregnant women, music alarm for children,dog training and portable paging system. 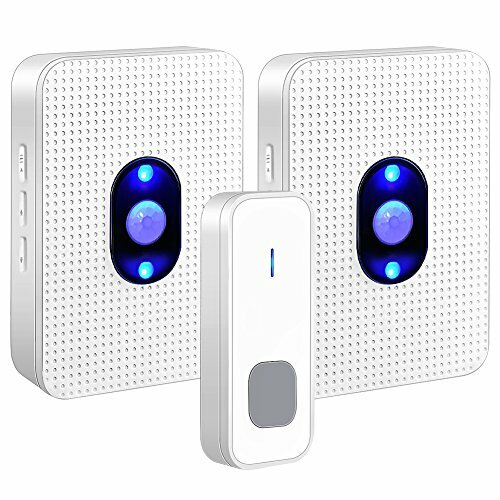 LED FLASH&NIGHT LIGHT : The LED indicator in wireless door alert receiver and sensor offer additional assistance for the hearing impaired.Built-in body Induction night light auto turn on and 45s delay off in the dark . IP55 WINDPROOF&DURABLE: The push button powered by 12V/23A battery is rated IP55 weatherproof and dust proof for both indoor /outdoor. Working between -22 degree F to 158 degree F withstands various harsh/cold weather conditions. EASY SET UP&100% Guarantee: With its simple wireless plug-in receiver and battery operation transmitter, the wireless door and window chime sets up in seconds . If you are not satisfied with your wireless doorbell, just return it, we will replace it or refund your total purchase with no additional cost. If you have any questions about this product by SilkRd, contact us by completing and submitting the form below. If you are looking for a specif part number, please include it with your message.